There are two temperature settings on the weed burner, for smaller areas use power setting one; this setting is the lower of the two at 60°C and can be used for smaller weeds. The second setting is the higher of the two at 650°C, this powerful setting should be used for larger weeds in a bigger area. Both these settings work in conjunction with the directive cone to give precise weed control in seconds. Review:Appears to work as described. To early to tell if weeds will grow back again. Easy to use. Just need to be careful handling it when hot. Review:Only used it once but was totally satisfied with the result and ease of use. I hardly bent my aging body (which is 90 years old in early 2019). Would recommend it to anyone, but would stress that, " when all else fails" read the instructions. Our Reply:Good afternoonThank you for leaving this feedback and I am glad that you are happy with your purchase. It is wonderful to know that you are happy with the quality of your weed burner and I thank you again for your positive review. Review:Not used yet due to weather conditions so unable to rate the item. As I have to put something I can only put average for now. 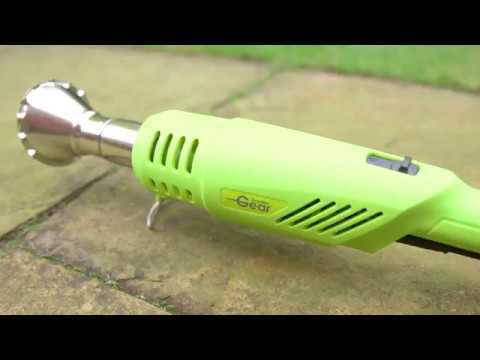 Our weed burners are a big seller and I am sure that you will be very pleased once you have used it. Thank you again for your review.